Yes, it is good that such information is sought and I only hope that someone or some system scrupulously goes through to see that the driver will not be a hazard. When I renewed my driving licence in December, I had to get a doctor to fill in a form and sign to be attached to my application form for the renewal. They may contact my doctor when I have filled in the form, I have to give my permission for them to do so. The Department for Transport (DfT) in the UK says there is no evidence older drivers are more likely to cause an accident, and it has no plans to restrict licensing or mandate extra training on the basis of age. There were 10,974 accidents involving drivers over the age of 70 in 2011, says the DfT. That compares with 11,946 accidents involving 17-to-19-year-old drivers and 24,007 accidents involving 20-to-24-year-old drivers. Its statistics do not account for who caused the accident. Figures also show that 46 drivers aged 16 to 19 died in an accident, while 173 drivers aged between 20 and 29 involved in an accident died. That compared with 59 deaths in drivers aged between 70 and 79 involved in an accident, and 52 over the age of 80. The young-versus-old driver data is used by a number of road safety charities to argue elderly drivers don’t pose the greatest danger behind the wheel. Very interesting information indeed. I would not be surprised if it is somewhat similar here too. For one, the oldies don’t zoom around on two wheelers here! I am still waiting to hear from my doctor… maybe tomorrow. I have just two weeks left to meet the deadline. A formidable form. Good luck! I will fill it in honestly and hope I am allowed to continue driving. I will deal with the result when it comes. Goodness. I don’t think there are any forms for us to fill out, other than signing our name and indicating some choices, such as whether we are organ donors, etc. I guess I’ll find out, though. My license expires in 4 weeks, so I guess I need to get down to the State Revenue and Drivers Control office sometime soon. Mike They sent out the form to me by post a couple of weeks ago. I edited out the personal information in 1a when I scanned it for use here. I need to get on with it, the old one runs out in about four weeks. That reminds me, my license will be up for renewal this year. Hope they don’t find out about those parking tickets I never paid. Al, make sure it is up to date before travelling. In Europe, you may not be allowed to hire a car with a licence with three months or less to run. My licence doesn’t expire until next year when I’m 70. Then I shall discover just how easy or hard it is to renew it. Nick, I’ll hit that age marker before you… I’ll keep you posted. Renewals at age 70 plus are free. 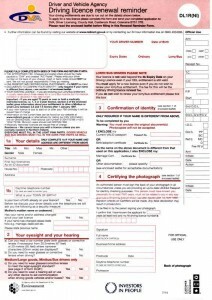 For more information : http://www.nidirect.gov.uk/driver-licensing. I think you have to hit 90 here before they start to get antsy. I know several 90+ers still out there tootling around. I don’t know what I’d do without my licence. I’d have to move. I did know of a few men who carried on driving right into their mid ninties, I never wanted to be behind them in traffic, they were accidents waiting to happen. Goodness Sakes, GM. Good luck! The photo has been taken and certified, the form filled and checked… next stage is to send it off with fingers crossed they allow me to continue driving. I have a month to find out! However, I’m in line in a few months time to get a different kind of card – one called a GoldCard – which will give me a few freebie and discounts when it is needed. I know you can get your photo on – and plan to do that because apparently I don’t look old enuff to get one! Your GoldCard sounds interesting it makes for handy ID. Do it properly and it will be safe for everyone. It just occurred to me that driverless cars would be ideal for us oldies. It wouldn’t matter any more if we were blind, deaf, arthritic or whatever. We’d just pop into the passenger seat (btw, what happens to the driver’s seat?) and then the car would drive itself. I see what you mean. The potential obstacles are pretty numerous! True Nick, but then we never thought we would see man on the moon! I just had to do all that too, to get permission to drive after 70! I feel about 30 so don’t really know what they are going on about. I did send it in and did get my licence but only for 5 years. Love all your stats – will try to remember some of those. Sorry I haven’t been in much recently – life is very hectic at the moment. Never worry, Sally, I have been a little hit–and–miss my self lately… plenty of distraction but little to show for it. May 2016 be healthy and full of adventure for you and yours! 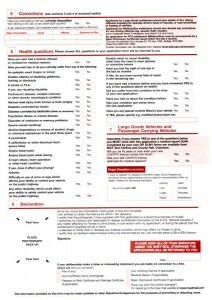 My Doctor has a form to fill in now, to give further info on my medical position. I hope the answer is favourable. Fingers crossed. Grannymar, 10th of February, long time no post of yours. Hope you are not fatigued and all is well your end. Life happens and priorities change, Today saw a turning point and I am about to write my post.